Have you heard the good news? 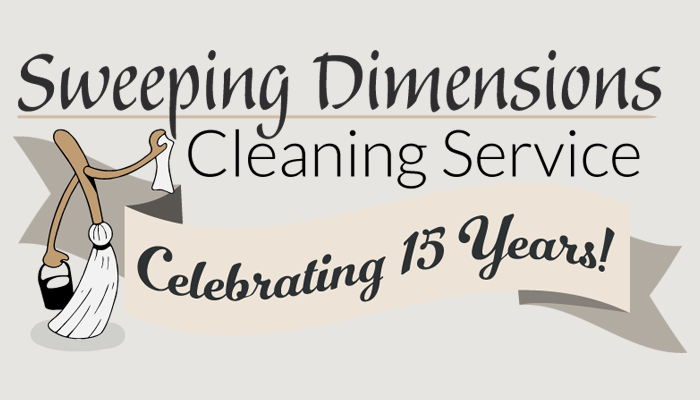 Sweeping Dimensions is turning 15 years old! That’s right! As of April, 2019, we’ve been around for a decade and a half — and we owe our continued growth to so, so many different people. From the men and women who have been employed with SDCS and given so much throughout the years, to our many long-term customers throughout Chicago, we have so many people to thank for their constant support! Our continuous growth comes from the opportunities we’ve received from the people we serve. 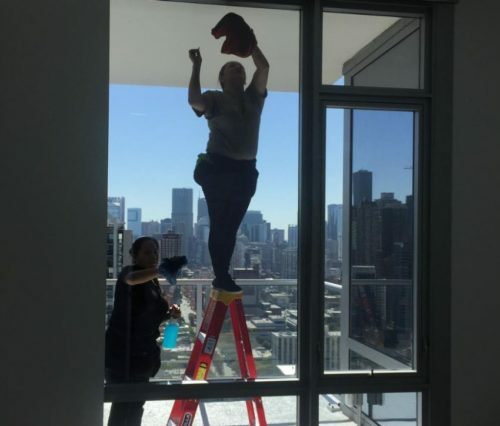 Today, Sweeping Dimensions has earned a glowing reputation as one of the best cleaning companies in Chicago. Families, renters, property managers, and developers know SDCS for our spectacular service, unparalleled attention to detail, and legendary professionalism. 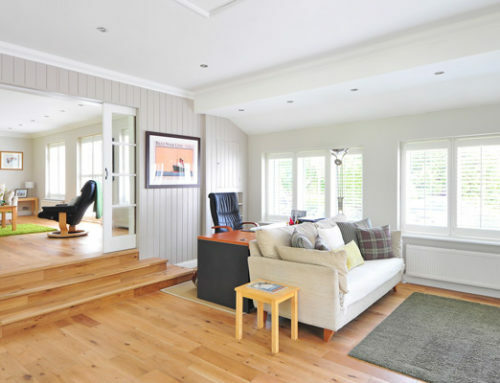 Our clients have come to expect the very best from our teams, and we are proud of our reputation as a company that is adept at immediate turnaround of vacant apartments, exceptionally clean common areas, and superior customer service, at all times. And it’s all because of one “light bulb” moment. That’s right! 15 years ago, Sweeping Dimensions started with one very bright idea. 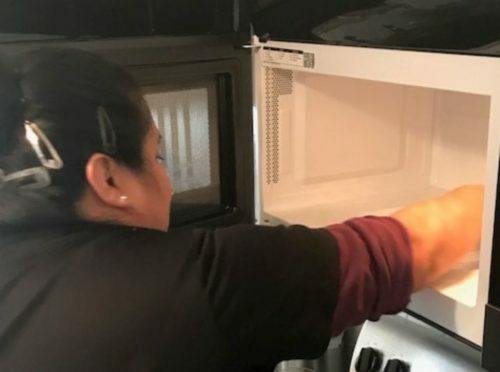 In 2004, Dr. Doris Ayala, an experienced psychotherapist and co-founder of the Latino Family Institute of Oak Park, saw a need in her community. 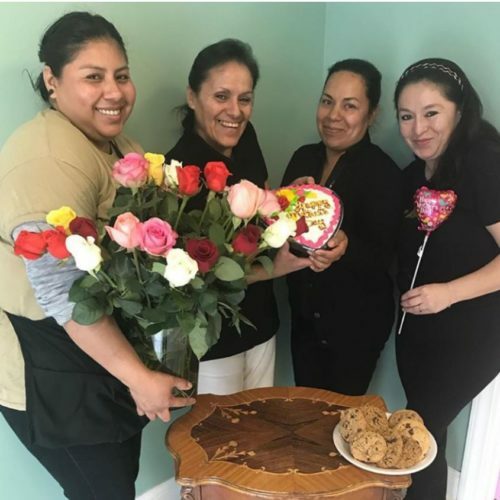 As she worked to counsel the women around her, she realized that many hard-working and self-motivated individuals were looking for employment, but finding it difficult due to language and educational barriers. And so, she created Sweeping Dimensions, to help provide opportunities to the people in her community. 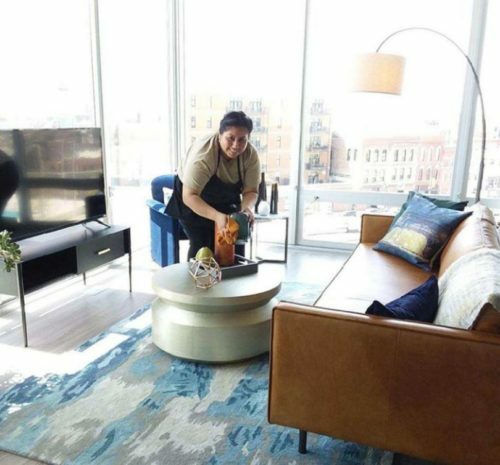 “With the same thoroughness she uses in therapy, Ayala often goes out with her crews as they clean luxury homes and offices across Chicago. She supervises the mopping and scrubbing and does some dusting and vacuuming. She leads a double life — part clinician and part cleaning boss — helping her clients and employees turn their lives around. It didn’t take long for Sweeping Dimensions to earn its stellar reputation all around Chicago. Part of the reason for our quick success was Dr. Ayala’s smart approach to service. Spotting her new hires’ experience in residential and commercial cleaning, Dr. Ayala began an extensive and ongoing training program in cleaning, resembling boot camp, to ensure that everyone on her staff would be able to provide Sweeping Dimensions’ customers with the absolute best cleaning services around. Out of this extensive training came SDCS’ signature team units. At every job, each and every Sweeping Dimensions team arrives to work in full uniform and wearing company-designated name tags. 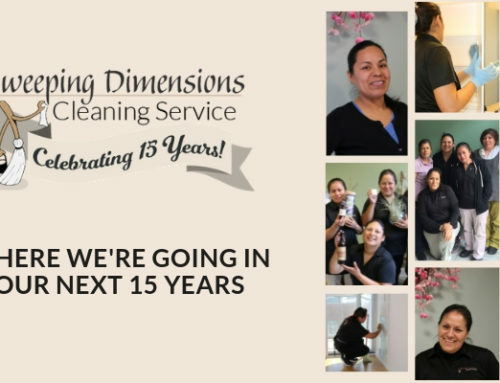 For 15 years now, each team has been led by a passionate team leader that focuses on one primary goal: to always provide Sweeping Dimensions’ customers with high-quality, customized cleaning services in a professional and trustworthy manner. And we’re not slowing down in 2019, and beyond! Since taking over Sweeping Dimensions in 2010, our CEO Lari Diaz, Dr. Ayala’s daughter, has brought her her own style of hard work and innovative thinking to the company. Lari has been part of SDCS since the very beginning. She began working in Operations and Marketing, and soon took on jobs including driving teams, talking to customers, handling work orders, and marketing to new audiences. Today, Lari has grown Sweeping Dimensions’ services to include both residential and commercial cleaning, as well as luxury multi-family properties. Our company has partnered with some of the most innovative property developers and management companies around Chicago. We’ve focused more on education than ever, creating our beloved blog and digital newsletter full of tips, tricks, and inspiration, while also building a strong community across social media, including Facebook and Instagram. And we’re stepping up our efforts to go green as we head into the future. Conservation and sustainability are a core part of our mission here at SDCS, and we’re working hard to protect our oceans and waterways. We’ve partnered with remarkable charities like Blue Ring Inc., 4Ocean, and Mission Blue, and we’re making huge strides to make our company more sustainable, including dramatically reducing our plastic use, swapping out disposable products for reusable alternatives, and committing to environmentally sound cleaning products and brands for all clients. As we blow out the candles on our birthday cake, we wanted to thank everyone who has made the last 15 years possible. Here’s to another 15 years of learning, growing, and making life easier for people across Chicago! 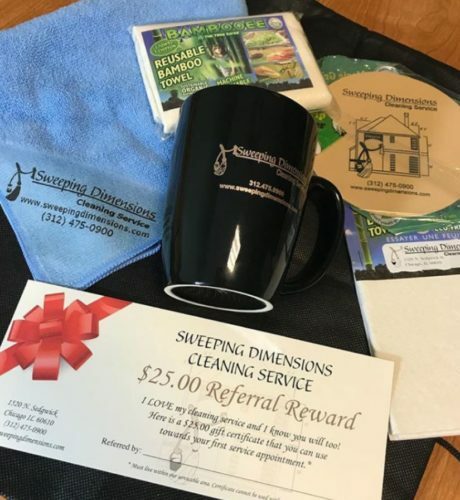 Want to show your support for Sweeping Dimensions? Leave us a review on your favorite site, like Yelp, Google, or Facebook. Want to learn even more about what sets us apart? Be sure to visit our FAQ page for more. 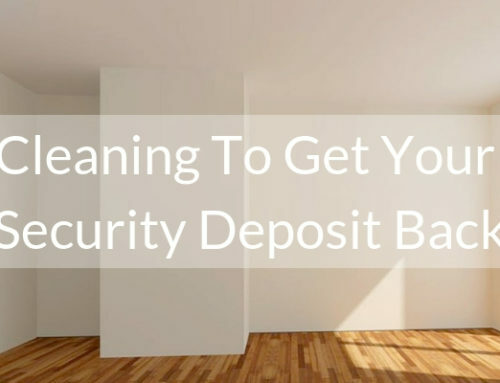 Ready to get moving on your next big project? Sign up for your next cleaning today! With gift certificates and our signature referral program, it’s never been easier to give the gift of cleaning to someone you love! Here’s to 15 wonderful years – and to the incredible opportunities still to come!